Station Casinos has partnered with 11-time world pizza champion Tony Gemignani to open Little Tony’s at Palace Station Hotel & Casino. Located off of the casino, the Prohibition era-themed décor features red brick walls, red leather booths and a black-and-white subway tile floor. The Italian trattoria and classic pizzeria offers a variety of Gemignani’s Italian and American pizza styles and is the exclusive home of the winner of the "World's Best Pizza" at the International Pizza Challenge in 2014 --- The Dillinger --- a cast-iron pan pizza with smoked mozzarella, chicken, broccolini, pancetta, crushed red peppers, artichokes, garlic, Alfredo sauce and three cheeses. The menu also includes a selection of pastas, calzones, Stromboli, antipasti and salads, with a focus on authentic Italian ingredients and organically grown produce. The beverage program highlights more than 90 varieties of bourbon and whiskey. Little Tony’s is open daily for lunch and dinner. Little Tony’s, 2411 W. Sahara Ave., Las Vegas, NV 89102, 702-367-2411, 800-634-3101, 888-319-4661. Chef Bradley Manchester has opened Glutton, a restaurant featuring an eclectic menu of New American cuisine. Located on Carson Avenue, across from the Downtown Container Park in a renovated midcentury building, the design consists of stained concrete floors, exposed brick and a stone chef’s counter. Offerings include wood-oven roasted sea bream with fennel seed, Concord grape, Cara Cara orange and white balsamic; and arugula and almond wood-fired flatbread topped with goat cheese, robiola, shishito, honey and pesto. Through a partnership with local farms, a fresh salad and vegetable repertoire features dishes such as shaved apple and celery salad with torn herbs, crushed hazelnuts, Manchego cheese and Riesling vinaigrette. Desserts incorporate wood-roasted fruits, homemade ice cream and comfort-food offerings such as apple and olive oil upside-down cake with spiced pecan streusel and cider ice cream. Glutton is open daily for dinner, and Monday through Saturday for lunch. Glutton, 616 East Carson Ave, Suite 110, Las Vegas, NV 89101, 702-366-0623. After a three-year break from operating his own restaurants and working as a consultant for other eateries, celebrity chef Alex Stratta has opened Tapas by Alex Stratta in Tivoli Village. 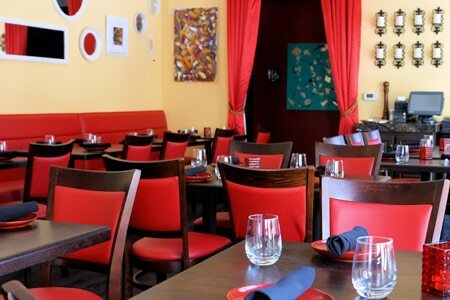 The upscale-casual concept serves modern tapas with prominent Spanish accents. The 5,401-square-foot restaurant, set in the former space of Poppy Den, is washed in a rustic yellow color palette with red and white accents, with wrought iron lighting fixtures, eclectic mirrors in various sizes and original artwork inspired by chefs. The menu lists 50 items, including paella, Spanish cheeses and cured meats, fresh seafood, organic meat, poultry and seasonal vegetables. Tapas by Alex Stratta, 440 S. Rampart Blvd., Ste. 180, Las Vegas, NV 89145, 702-483-3555. Pizza Rock by 11-time World Pizza Champion Tony Gemignani has opened a second Vegas location at Green Valley Ranch. The 7,000-square-feet eatery, located off of the casino seats more than 200. Design features include a large cocktail bar and 20-seat interactive wood-fire bar, more than 40 80-inch HD TVs with Xbox gaming systems and a full-sized 1964 Peterbilt truck extending onto the patio with a trailer full of vintage beer boxes. The 11 styles of Gemignani’s pizzas include New York/New Haven, Chicago cracker-thin, classic American, regional Italian, Roman, Sicilian, Californian, Detroit and gluten-free, and are baked in nine ovens, fired at temperatures ranging from 500 degrees to 900 degrees. To complement the pizzas, an extensive craft beer selection features beer from local breweries like Bad Beat, Banger, CraftHaus and Joseph James. Pizza Rock, 2300 Paseo Verde Pkwy., Henderson, NV 89052, 702-617-7777, 866-782-9487. Lago by Julian Serrano has opened in the former space of Circo at Bellagio. This is the first Italian restaurant from chef Julian Serrano (Picasso, Julian Serrano). Lago by Julian Serrano, Bellagio, 3600 Las Vegas Blvd. S., Las Vegas, NV 89109, 702-693-7111. Emeril’s Table 10 at The Palazzo is offering a four-course tasting menu designed by chef de cuisine Tim Doolittle, featuring Emeril’s staples and springtime dishes. Priced at $48, courses include a choice of seasonal soup, chicken and andouille sausage gumbo, Boston lettuce salad or Caesar salad; Emeril's New Orleans barbecue shrimp, candied North Country bacon with Noble Tonic No. 1, mushroom gnocchi or tuna crudo; pork tenderloin, pea ravioli, chicken breast and thigh with leek stuffing, filet mignon or skate wing; and a dessert of any menu item such as banana cream pie. Wine pairings are available for an additional $28. Table 10, The Palazzo Resort Hotel Casino, The Shoppes at The Palazzo, 3327 Las Vegas Blvd. S., Las Vegas, NV 89109, 702-607-6363. Celebrity chef Wolfgang Puck will create a special menu for VIPs attending the inaugural Rock in Rio USA Music Festival, being held on the Vegas Strip, spread out over 37 acres near the corner of Sahara Avenue. Puck will deliver his take on signature dishes from the U.S., United Kingdom and Brazil for the event, and the all-inclusive buffet will be included in the price of a VIP ticket, with offerings changing throughout each day, such as fried chicken and pimento cheese po’boys with okra kimchi, the Brazilian national dish feijoada --- Portuguese rice and chicken bobo --- and UK-themed bangers with stout onion gravy. In addition, the 4,000-person VIP area will feature air conditioning, an open bar and its own view of the City of Rock. For more information, visit www.RockinRio.com and to purchase pre-sale tickets, visit www.rockinrio.com/tickets. Rockhouse Las Vegas at The Venetian/Palazzo has launched a Sunday ROCK Brunch from 11 a.m.-6 p.m. Priced at $20 (plus tax and tip), it includes one breakfast dish from Rockhouse’s brunch menu, with items such as chorizo and egg tacos, green chili and egg tacos, asada steak and egg tacos, and breakfast dogs topped with scrambled eggs, Swiss cheese and bacon. There's also bottomless libations like mimosas, Bloody Marys, draft beer and well cocktails. In addition, live musical entertainment is offered from noon-6 p.m. Rockhouse’s traditional bar bites menu will also be served during this time at regular price. Rockhouse Las Vegas, The Venetian, The Grand Canal Shoppes, 3355 Las Vegas Blvd. S., Las Vegas, NV 89109, 702-731-9683. Mercadito at Red Rock Casino, Resort & Spa is hosting weekly Wednesday Tequila Dinners. Executive chef Juan Puentes presents a four-course dinner with off-menu, tequila-based dishes. Between courses, guests get to try anejo, blanco and reposado tequilas. The four-course dinner is priced at $36 per person, with a minimum of two people per table. There are four menus that rotate weekly over three months, to enable guests to try a variation of the tequila dinners, or return for their favorites. Mercadito, Red Rock Casino, Resort & Spa, 11011 W. Charleston Blvd., Las Vegas, NV 89135, 702-979-3609. "Rock n' Roll Chef" Kerry Simon is downsizing, as he is closing two of his restaurants when their leases run out. His KGB: Kerry’s Gourmet Burgers at Harrah’s closed the first week of April, and Simon at Palms Place at the Palms Casino Resort is slated to close on May 22. Neither resort has announced a replacement for Simon’s restaurants. Simon has been waging a medical battle against Multiple System Atrophy, and is confined to a wheelchair. His remaining Vegas restaurant, Carson Kitchen in downtown Las Vegas, will remain open. Simon at Palms Place, Palms Place Hotel & Spa, 4381 W. Flamingo Rd., Las Vegas, NV 89103, 702-944-3292.